This week I had a chance to set up the trellis for most of the new climbing crops. I also had to redo the grape one, because, when I moved I had taken it down. Now everything is ready for growing the season. I can't wait to see the tomatoes, beans and pumpkins climbing around. I did a different set up for every planter because they will all grow differently. One of the biggest is the big tomato, I think this will need the most support so I tried an A shaped trellis. For the mini tomatoes, a small square one for each will work well. And finally for the beans and pumpkin planter, I did a normal square wall. I hope they will be strong enough to carry everything. Of course I had to try doing the Japanese style. I used bamboo and japanese knots. 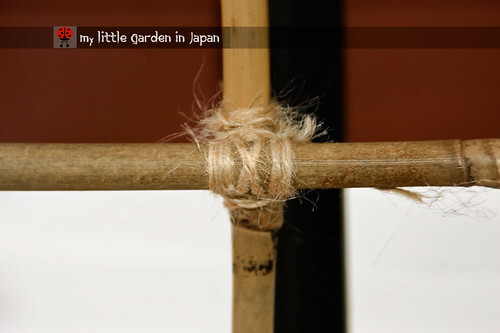 I like how it works with trellis, the bamboo looks very nice, and when tied with that knot is very strong and secure. The only thing is that, because the bamboo I use is slim and not processed, it rots easily. So, I can only use it for temporarily structures like these seasonal supports. Now for the grape, because it has to be a permanent structure, I used metal/plastic rods. Since my grape is only on its first year and is still very young, not much strength is required yet to hold it. I set four pillars and two rods joining them in across to secure all. However, in the future, when the grapevine gains more weight I will add two more rods across at the middle level for extra strength. Your trellis look very sturdy. With our climbing cool season crop, we are recyclying sunflower stalk as trellis. I think I use this type of knot - never knew it was Japanese! Your trellises look a lot neater than my cucumber-frame. I must try harder! I was fascinated by the different types of trellises. You have a way of making them neat and graceful. 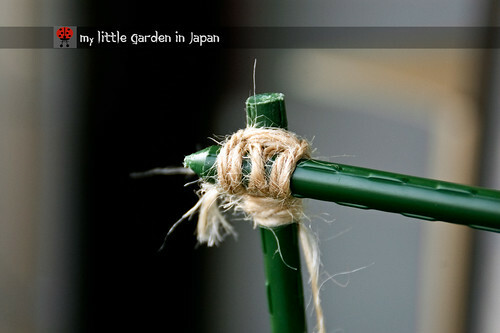 Your Japanese knots are interesting, it is quite a skill to tie bamboo together. Good tip about A-frames. I am always impressed when I see resourcefulness in action! I see that your grape vine is doing very well. Mine are very bushy now, I need to thin them a little bit. Your use of space is really amazing. The trellises will be splendid when the plants fill them. Thank you very much! I hope to see them growing soon. The tomatoes already started to climb. The day your grapes appear, we shall all make a toast to you and your magnificent balcony grapevine. Mine has all the space, but no inclination to bear fruit. Yay! Thanks Fer! 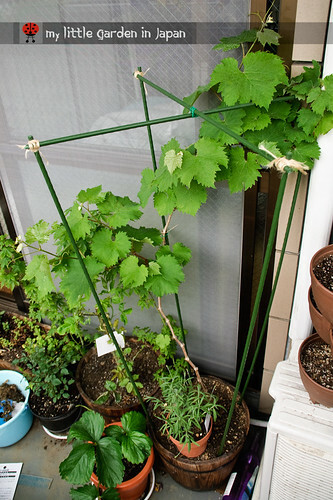 My grape plant is still small so I guess I still have time to set up its trellis. Yours looks wonderful already. Thank you also for posting about your tomato frame. They are next on my list if my leeks/onions are successful. I really like your trellis' and pretty knots! 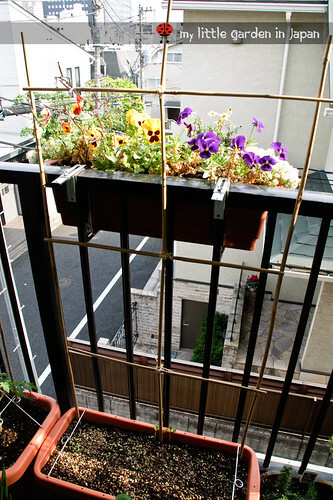 Your use of space on your balcony is incredible! You certainly know how to make use of all the available space. I'll be most intersted to see how your pumpkin plant grows. I'm going to be planting veggies (including pumpkins) in 5 gallon plastic containters. Still too cold here to plant. 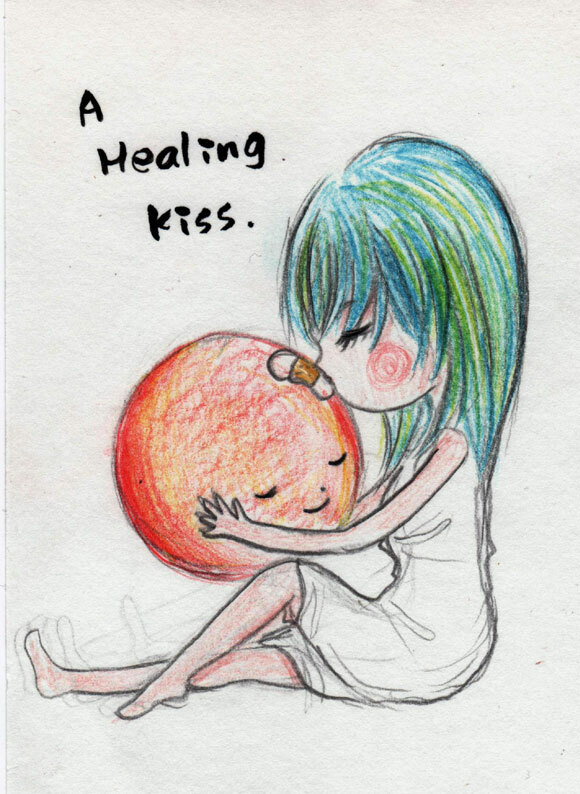 Was thinking of you, somehow I have missed your posts lately. 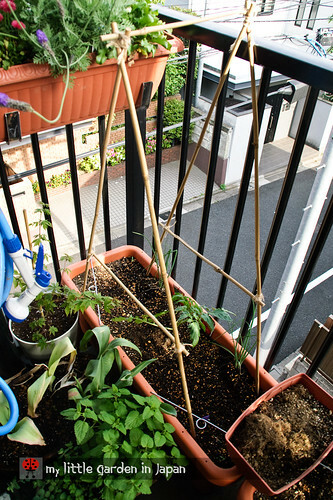 Your balcony 'farm' is an example to us all. Even the trellis is a sculptural thing of beauty in its own right! Fantastic ideas on trellising fer! I'm trying to figure out how to stake my indeterminate tomatoes this year but I don't think mine will anything as good as yours. Hi Fer, balcony gardening requires skill which differs a little from gardening in the open ground, you seem to have got it just right. I really must get some instruction on that Japanese knot. I have enough info on the knotweed. That's a neat article; thanks! Here, we use bamboo sticks to make similar structures. I may use metal rods for my grapes creepers. Wow! Beautiful trellises and they seem very inexpensive, too. I realized yesterday that I take bamboo for granted -- there were some little boys visiting my garden for the urban farm tour with their parents and they were completely enamored when they discovered some bamboo stakes. One boy said, "WOW! It's real bamboo... whoaaaaa!!!" while the other looked on wide-eyed. I might as well have been staking my plants with diamonds. (It was cuter before they pulled them out of the ground and started "fencing"). Thank you very much! The trellis already started to work, the tomatoes and beans are slowly taking over. Love these! I'm book marking this post so I can come back to it! 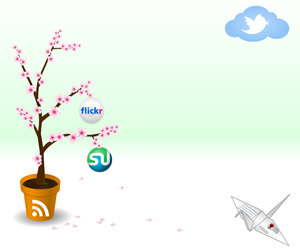 Thanks for an interesting blog. I have considered whether to have a pergola in my garden, but it can get very windy here, so as yet am undecided.